Do you watch Designated Survivor? Recently, we reported the ABC TV series might be getting a season two renewal. If it does, will you keep watching? The political thriller follows Tom Kirkman (Kiefer Sutherland), a lower-level Cabinet member, who ends up becoming the President of the United States after an attack on the capital. The cast also includes Natascha McElhone, Adan Canto, Italia Ricci, LaMonica Garrett, Tanner Buchanan, Kal Penn, and Maggie Q. 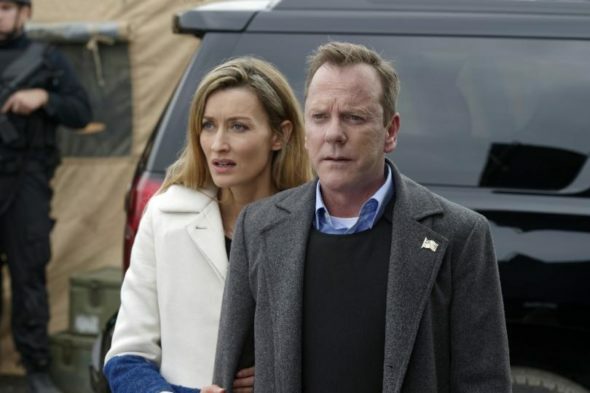 Designated Survivor premiered in September to a strong 2.24 rating in the 18-49 demo and 10.037 million viewers. And while the numbers have declined, the show is still a consistent performer for ABC. Currently, the series is averaging a 1.35 rating in the 18-49 demo and 6.203 million viewers. What do you think? Are you a fan of the political drama? Would you watch a second season of Designated Survivor? Love the show and will definitely continue watching! It’s very believable! I’ll watch Designated survivor as long as I can walk. Love the show soooo glad it is coming back. Can’t wait to watch it. I love this show! It is just about the only one i watch live. This is my favorite show ever. I would rush home to see it. Please do not cancel it. Yes. This is absolutely my favorite show. I cannot wait for Thursday night’s so I can watch it. My wife and I LOVE Designated Survivor. My wife and I LOVE Designated Survivor. Please DO NOT cancel it!!! !